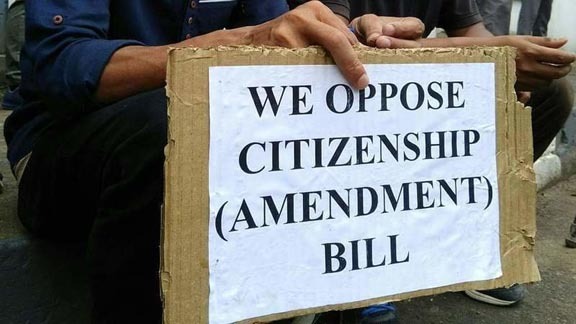 While Mizoram’s apex student body, Mizo Zirlai Pawl (MZP) has consistently taken concerned efforts in protesting against the citizenship bill in partnership with Northeast Student Organization (NESO) and also under the wing of the Mizoram NGO Co-ordination Committee, it has slammed the State Government over their inaction. “When we planned to organize a total boycott of the Republic Day, we made a compromise after the government under the leadership of the Chief Minister made an appeal not to carry out a total boycott,” said MZP president Ramdinliana Renthlei. “The CAB is likely to be discussed in the Rajya Sabha on 12th February, 2019 but it seems like the Mizoram government is not concerned about this bill as they have not held any meeting on the subject or held any form of protests against the bill,” said Ramdinliana. “The Mizoram NGO Coordination Committee made a compromise for the government, but we do not see any point of giving the Chief Minister time to prepare himself with a ballboot as we are not seeing a goal scored anytime soon,” he added. Recently, the North East Students Organization (NESO) had made a trip to the country capital to meet political party leaders and plead with them not to support the bill. From Mizoram, Ricky Lalbiakmawia, finance secretary of NESO and B Vanlaltana, vice president, MZP were part of the team. “We went to Delhi in seeking the support of political leaders in our fight against CAB especially in the Rajya Sabha now that it is likely to be discussed again. We are seeking for an alliance that will vote against this bill,” Ricky Lalbiakmawia, NESO finance secretary said. “On the bill going through as a statutory bill, Ricky said we understand that the BJP especially Narendra Modi is very adamant on passing the bill regardless of the sentiments and the interest of the Northeast people. But so far we are very happy with the positive reaction of all who have met,” he said. Even parties such Shiv Sena which whose ideology is based on Hindu nationalism has reportedly assured the NESO that they will vote against the bill. “Regardless of their religion, the Shiv Sena said they will stand for indigenous people as they do not want illegal immigrants,” said the NESO Finance Secretary. “If they pass this regardless of our efforts, there will be anarchy and chaos everywhere in Northeast,” he added. Ricky Lalbiakmawia also commented on the BJP president J V Hluna’s remarks that the CAB is not dangerous for Mizoram saying, “It is unfortunate and disgraceful for a Mizo leader to have made such a statement when all the Mizo people are worried about this bill and what effect it will bring to us. I respect J V Hluna but his statement shows he is ignorant of what the true consequences the bill will bring. He did not say this for the interest of the Mizo people but only for the BJP party,” he said. NESO met leaders such as JDU leader Prasant Kishore , BJD MP and Lok Sabha Leader Bhartruhari Mathab, Meghalaya chief minister Conrad Sangma, Rajya Sabha Parliamentary Leader and Shiv Sena spokesperson, Sanjay Raut, Congress president Rahul Gandhi, Shiv Sena Chief Uddav Thackeray and his son Aditya Thackeray.